Welcome and good afternoon! Five years ago, I presented my first official address to the University. In that speech, I proposed a path for our University that followed from the bold vision statement that had been developed during the strategic planning process. That vision statement, which we have all repeated often and which appears on a banner in the Goshen Lounge for all SIUE community members, friends of the University and visitors to see, reads: "Southern Illinois University Edwardsville, as a premier Metropolitan University, will be recognized nationally for the excellence of its programs and development of professional and community leaders." Perhaps due to its newness, in my discussions with you during my first few months on campus, it was apparent that debate existed within the University regarding the vision statement. The debate was framed by these questions: What is a premier Metropolitan University? Are we one? And if we are not, what does SIUE have to do to become a premier Metropolitan University? My approach to the questions and debate on this issue was straightforward. In the course of that first speech, I laid out an argument that, in fact, SIUE already was a premier Metropolitan University. And I cited several of the many accomplishments of our faculty, students, and programs to support that claim. The challenge for SIUE, as I saw it, was not to debate the fact of our premier status, but rather, to focus on the outcome of our vision statement: achieving national recognition for the excellence of what we do. On that day, we shifted our institutional paradigm from seeking acknowledgment of what we were, to becoming all that we could be. Let me quote what I said in October 2004.
" What we need to do now is to determine the path that we will take, the strategies that we will adopt, to achieve excellence to the fullest and attain national recognition. In short we must create an 'intentional future.' I believe that from now on, everything we do, every piece of official University literature, every public declaration about the University, should communicate the fact that we are a 'premier Metropolitan University.' I should emphasize that I realize this claim shifts the emphasis on discussions of our vision from 'what is premier?' to what we need to become 'nationally recognized.' That, of course, is exactly what I intend. … We have a strategic plan to get us there, and we have wonderful long-term goals to emphasize as we move forward: engaged students and capable graduates; innovative high-quality programs; committed faculty and staff; harmonious campus climate; active community engagement; sound physical and financial assets; and excellent reputation. In fact, I have given you today a business card with the Vision, Values, and Mission of SIUE on it. THIS is the business of SIUE!" "We start our quest now. We will make material progress by 2010. And we will achieve national recognition by 2015." So, five years after 2004 and just a little more than two months from 2010: How are we doing? Today, I am pleased to report that this fall we appear on a U.S.News & World Report America's Best Colleges list of 77 "up-and-coming" universities in the United States, recognizing SIUE as having "recently made the most promising and innovative changes in academics, faculty, students, campus, or facilities." We have also been recognized for our senior assignment program by the Association of American Colleges and Universities in 2006 and by U.S.News & World Report for five consecutive years beginning in 2005. And we have been listed among the Top 15 U.S.News & World Report Midwestern Master's Universities for the last four consecutive years. Are we making material progress in being recognized nationally for the excellence of our programs? You bet we are! Now let's further examine our progress by considering the three initial goals we set out to accomplish in October 2004: First - alignment of our enrollment management program to attract a student population that is characteristic of a premier Metropolitan University; Second - position SIUE as a premier Metropolitan University in the marketplace of ideas or, in other words, to establish our "brand" in the higher education community; and Third - develop our resource base. We continue to emerge as a first-tier, first-choice university for Illinois and metropolitan area students. This fall we enrolled 13,940 students, the largest enrollment ever, breaking the record of 13,700 set in 1970. Since 2004, we have increased head count enrollment by 447 students; yet our full-time equivalent enrollment increased by more than 1,000 students (from 10,778 in 2004 to 11,806 in 2009). This enrollment growth in full-time students is a result of adding our School of Pharmacy, increasing our residential capacity with the addition of Evergreen Hall to our campus in 2007, and enrolling predominately full-time commuting students. We have expanded our enrollment while steadily enhancing the academic preparedness of our freshman class, increasing the average ACT of our 1,723 freshmen in 2004 from 22.3 to an average ACT of 22.8 for our 1,950 freshmen this fall. We have both grown the freshman class since 2004 and increased the percentage of students with an ACT of 25 or greater from 25% to 30%! Our graduate enrollment of 2,285 is similar to that of 2004 when we enrolled 2,484 students, but it has increased by more than 10% from the low of fall 2007 (2,037), just two years ago. These results reflect material progress toward meeting our goal of enrolling students characteristic of a premier Metropolitan University. And we have done it while maintaining our commitment to diversity. This fall, we enrolled the largest number of African American students (1,423 or 10.2%) since 1993 (1,553), and the largest number ever of Latino/Hispanic (288 or 2.1%) students. We are now assisting more students with financial aid. This fall, 191 freshmen were awarded SIUE scholarships, as compared to 75 such students last year. Of these, 17 students received E guarantee awards, which provide low income students with all of their remaining financial need. We said in 2004 that we could attract academically well-prepared students while maintaining the diversity of our student population, and we have progressed in achieving these goals. We have been greatly assisted in this accomplishment by Scott Belobrajdic, Assistant Vice Chancellor for Enrollment Management, and Todd Burrell, Director of Admissions, and their respective staffs. Would they all please stand and be recognized. With respect to our stated goal of positioning SIUE as a premier Metropolitan University in the marketplace of ideas, we have also made material progress. You have seen many representations of SIUE in the media, some initiated by us, others as a result of being recognized for our accomplishments. We have advanced the SIUE brand for excellence. You see it in our radio and TV spots, in our press releases and billboards, in our recruitment publications, and in the focus we have placed on the power of " e" campaign, designed to differentiate SIUE from similarly-situated schools. During the past five years, we have begun an integrated marketing approach to our efforts, consistently representing who we are, regardless of the area being highlighted. We measured 2,663 media exposures in 2006 when we first started keeping records and 5,827 media exposures in 2009, an increase of 119%. These media representations have been generated every day in local, regional and national venues; through newspapers, radio and TV broadcasts and the internet; and in industry and trade publications. During the last five years, we have markedly changed the perception of entering freshmen, with the most cited reason for attending SIUE now being "good academic reputation" versus "affordability and beautiful campus" in 2004. Would Executive Director of University Marketing and Communications Elizabeth Keserauskis and her staff please stand and be recognized. Let's now view a new promotional video, showcasing our excellent programs and some of the reasons why students decide to attend SIUE. As you watch it, you'll see the energy and commitment to our students that are reflected in our Schools of Business, Dental Medicine, Education, Engineering, Nursing, Pharmacy, our Library, the College of Arts and Sciences, and the Graduate School. I want to recognize our two students who star in this video, Megan Dennis and Jay Herchenbach, who are with us today. Will you please stand. I want you to know that the messages we have communicated have not only been video and radio advertisements designed to recruit students. Getting the word out regarding other important issues - for example, our senior assignment program; the Student Success Center innovations; and our Faculty Excellence Campaign have all been designed to position our faculty and our University as leaders in the field. With regard to developing our resource base, in 2004 we determined that the "manifestation of our institutional vision would not be solely dependent on the level of state funding." In addition to our efforts to enhance state funding, we committed ourselves to "attract more grants and contracts and raise more funds from private, corporate and foundation donors." We have also made material progress in this area. Following a protracted effort to obtain funding for our science complex, a capital bill was passed this summer providing $78.9M for the project. 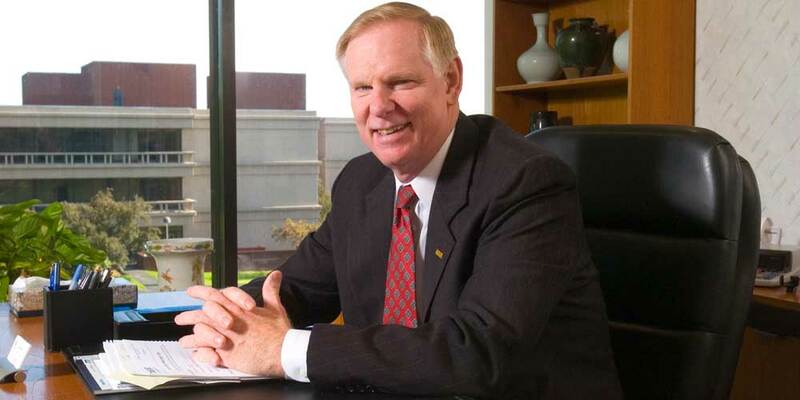 President Poshard played a significant state-wide role in this accomplishment, serving as a spokesperson for higher education with regard to capital construction projects. He continues to assist us as we work with the State Capital Development Board to enable our project to be among the first to be constructed in the state. We are beginning the third year of our capital campaign, and we have received $19M so far in funds from corporate, foundation, and individual donors. Most of these monies have been designated by the donor for scholarships, construction projects, or even our beautiful The Gardens at SIUE project. We have also been assisted in this campaign by our faculty and staff. In 2006 we instituted SIUE Day, designed to provide an opportunity for faculty and staff to support the departments where they work or the University at large. I'm pleased to say that our FY09 SIUE Day campaign produced $243,900 in gifts, with about 30% of our faculty and staff (712) contributing. Would Vice Chancellor for University Relations, Patrick Hundley, Julie Babington, Director of Annual Giving, and the University Relations staff please stand and be recognized for their year-round development efforts and work on SIUE Day. As outlined in a recent report by the Office of the Associate Provost for Research, we have also made great progress in securing grants and contracts. "In FY 09 SIUE faculty and staff received more than $29 million in grants and contracts for research ($8.45M), academic instruction and support ($1.36M), and public service ($19.5M) projects; a 56% increase since FY 04 (from $18.8 million to $29.3 million). The growth in faculty research and scholarly activity, supported by extramural funding increased a record 254% (from $2.4 million to $8.5 million) over the same 5-year period. Importantly, 42% of the SIUE full-time faculty apply for grants and contracts. This extraordinary level of faculty activity is reflected in SIUE's ranking when compared to its current IBHE peers. As reported in the most recent data available (FY 07) by the National Science Foundation ( nsf.gov/statistics/nsf09303), SIUE ranked highest among its peer institutions with $26.9 million in total research and development expenditures. In that same report, SIUE is ranked 211 by the NSF for all research and development expenditures compared to 662 total listed institutions nationwide." I would like to add that, while these data are obtained from the National Science Foundation, they include all other grants our faculty receive, such as from the National Endowment for the Arts or the National Endowment for the Humanities, so these data truly reflect all of the University. I'd like Steve Hansen, Associate Provost for Research and Dean of the Graduate School, his staff and all those assembled who hold or have applied for grants or contracts at the University to please stand and be recognized. While we have made significant progress in the three initial goals of enhancing enrollment, transitioning from being a "best-kept secret" to a University with a nationally recognized record of excellence, and developing our resource base, these are not the only areas where we have excelled. To improve our campus environment, we have completed $140M in construction and infrastructure enhancements since 2004. This includes the construction of Evergreen Hall, the Early Childhood Center expansion, the Student Fitness Center addition to the Vadalabene Center, the renovation of the Vadalabene Center, and the Student Success Center. Also, we have completely changed the signage, way finding, and entrances to the campus while increasing our sense of community by adding landscaping, sidewalks, improving roadways, traffic flow, and upgrading the interiors and lavatories in many of our buildings. Many of you have told us how much the improvements on campus have enriched your work environment and sense of pride in what we do. With the imminent construction of the science building complex, the Multi-Disciplinary Laboratory at the School of Dental Medicine, and the continuation of the renovations in our building project plans, we will have completed more than a quarter of a billion dollars in construction and renovation projects since the formulation of our vision statement. And we will have done so with attention to sustainability by creating spaces with "green-roof" technology and LEED certification to reduce our carbon footprint. I would ask Vice Chancellor Kenn Neher, and the staff members who are here from his division to please stand and be recognized on this, National Sustainability Day, for their accomplishments. We have also significantly enhanced what we do for students during the past five years. We have continued to support and expand our fine Library, with additional renovations scheduled for this year. Most significant is the concept that led to the programs and activities housed in the new Student Success Center. By consolidating the Academic Advancement Center, with SOAR (Student Opportunities for Academic Results), Instructional Services, Academic Advising, Health and Counseling Services, Disability Support Services, Student Government, the Career Development Center, the International Center and Honors Program in one convenient location, our staff is better able to support our students in their education. What is remarkable is that this concept was embraced by our students who worked with Vice Chancellor Emmanuel and voted a fee on themselves to fund the building that houses the Center. At this time, I ask Brandon Rahn, President of the Student Government, to stand and be recognized on behalf of all students. What is more remarkable about the Student Success concept is that an advisory board reporting directly to Vice Chancellor Emmanuel and Provost Ferguson has been formed to ensure that all programs in the Student Success Center are effectively collaborating to provide synergies in their support of student retention and graduation. In my October 2005 speech, I noted that our six-year graduation of 43% for those students who started at SIUE in 1998 needed to be improved. As with the Student Success Center, many of the initiatives we have instituted during the past five years have been targeted toward degree completion. Today I can report material progress in that area as well. Our 43% six-year graduation rate for 2004 graduates is just five years later 49% for 2009 graduates! The level of interaction we enjoy between Academic Affairs and Student Affairs is unusual and says a great deal about the two divisions and their leadership. Will Vice Chancellor Emmanuel, Provost Ferguson, and the staff members from these two divisions, as well as Dean Regina McBride and those assembled here from the Library and Information Services, please stand and be recognized. SIUE's leadership in the Academic Affairs area continues to be evidenced in a variety of ways. This year we will complete planning for our new Lincoln general education program that will better prepare students for the 21st century. As I announced last year, we are hiring additional academic advisors, such that by fall 2010 every one of our incoming students will be advised by professional advisors, allowing faculty to serve as mentors. To expand faculty mentoring opportunities, we have initiated the Undergraduate Research and Creative Activities (URCA) program to foster in-depth student/faculty interdisciplinary interaction. In its first year, URCA will provide for 126 students to work with 91 faculty. In order to showcase URCA opportunities, we created this promotional video. I'd like to recognize the stars of our video - Professor Jerry Weinberg, and students Brittney Barr, Brent Beer, Kelli Levek, and Vanessa Stock. Would you please stand. In addition to providing more time for faculty to mentor students and work with them on URCA and other projects, we are employing more faculty. We employed 528 full-time instructional faculty in 2004 and 621 this fall, an increase of 93 faculty (18%). And, despite the difficult economy, we have authorized 29 searches for tenure-track replacement faculty for fall 2010. Five years ago, we had not yet admitted our first class in the School of Pharmacy. In spring 2009 we graduated 80 well-trained pharmacists, mostly into service in Illinois. The Accreditation Council for Pharmacy Education (ACPE), when recommending the SIUE School of Pharmacy for accreditation, praised the school as serving as a model for other new pharmacy schools around the country. The School of Pharmacy joins the School of Dental Medicine and the School of Nursing as nationally recognized programs of quality. These schools assist us in the fulfillment of the Illinois Board of Higher Education Focus Statement for SIUE which specifies our role in health care and the health professions. And, as I indicated here last year, that commitment will be expanded through the development of health sciences degrees to serve the increasing number of pre-professional students we enroll. Would Deans Phil Medon (School of Pharmacy), Ann Boyle (School of Dental Medicine), and Marcia Maurer (School of Nursing) and their faculty and staff please stand and be recognized. I would also like to take this opportunity to recognize the SIUE East St. Louis Center, which serves as a national model for how universities can empower people and strengthen communities. During the last year the School of Education has broadened and expanded its work at one of the programs of the Center, the Charter School for high school students. In the area of literacy and instructional technologies, our faculty have been working on-site to increase the academic success of students at the school. The mission of the East St. Louis Center is to provide comprehensive programs, services and training in education, health, social services and the arts. Patricia Harrison, director of the Center, you and the hardworking staff of the East St. Louis campus make a major difference in people's lives each and every day. Please stand and be recognized, along with Dean Bette Bergeron and the faculty and staff from the School of Education. Each year I recognize the important work of our staff in enabling SIUE's ongoing efforts and reputation for excellence. This year I have invited all recipients of the Employee of the Month award since its creation to attend as representatives of the good work of all of our staff. Would the Employees of the Month who are assembled here please stand and be recognized. Thank you very much for the support you've shown our students. During my annual report to the University, I typically outline a series of new initiatives. This year is no exception! First, WSIE, our University radio station, has moved administratively from the College of Arts and Sciences to University Marketing and Communications under the direction of Elizabeth Keserauskis. An advisory board has been formed consisting of faculty, administrators, staff, and community members regarding future programming of the station. This much is now known - the station will: retain its jazz format but will feature our SIUE jazz program, faculty and students; support our Division I sports programming; and be used to expand the reputation of SIUE. This will be yet another important "window" into the University and will highlight the diversity of our programming. Second, Vice Chancellor Emmanuel has created a task force to consider whether the future of residence life will include honors or Greek housing. As with all our initiatives, consideration of special purpose residence life must meet the criteria of promoting academic success, personal development and social responsibility, and it must advance SIUE's commitment to excellence. Vice Chancellor Emmanuel and Provost Ferguson have also finalized planning for an International Education Task Force to create and advise us regarding a set of principles to support and expand our international programming, both for our students and visiting students. Third, the School of Nursing has begun a "one plus three" program on the Carbondale campus. SIUC faculty will teach the first year of the program, and the last three years of the curriculum will be taught by our faculty, culminating with students receiving an SIUE degree. In its first year, this fall, approximately 75 students are enrolled on the Carbondale campus for the SON program. This system-wide cooperation follows our cooperative Ph.D. programs in Engineering and History with SIUC. Let's recognize Dean Maurer, along with Dean Hasan Sevim, and our newest Dean, Al Romero, and the Engineering and College of Arts and Sciences faculty and staff for these accomplishments. Will they please stand. Fourth, the Board of Trustees has approved planning for additions to the School of Engineering building, the Art and Design building, and construction of an athletics building on Stadium Drive, that would free up space on campus. While we consider future development, our highest priority for construction remains the Science Building complex. As I'm sure you know, the science complex project will have a profound effect on the University. For one thing, it will provide relief to our faculty in the College of Arts and Sciences who have for several years taught laboratories seven days a week to accommodate our students. The faculty in the College are to be commended for their dedication. What you may not realize is that, after the science complex is completed, space in the currently existing structure will be used as a temporary location for departments involved in our 21st century building project, a project that will eventually result in the renovation of every building on campus! And while we are talking about space, I should mention that the space vacated by those departments who moved to the new Student Success Center is having a profound impact on other programs. In particular, by the start of the spring semester we will have five new classrooms in Peck Hall, capable of accommodating 310 more students each hour! This fall, our enrollment increase includes 98 students in extended education. This is a significant accomplishment. Over a period of the last several years, we had been losing ground in the metropolitan area with respect to part-time degree-seeking students. Adult learners frequently opt for convenience, which means thatoff-campus and online courses have become more important. Even our on-campus full-time students should have the option of choosing online courses to experience that type of learning as an undergraduate. Although we have made some progress with online programming, we need to do more. The Provost, the Deans, and Roger Maclean, Executive Director of Educational Outreach, are now studying this issue to find ways to support faculty in online course and program development, and you will be hearing more about this. I would like to recognize Roger Maclean and his staff for their efforts in Educational Outreach. Would they please stand. Our quest for national recognition for excellence includes intercollegiate athletics. In 2007 the Board of Trustees approved our plan to reclassify all 16 of our men's and women's sports to NCAA Division I, and we became the 11th member of the Ohio Valley Conference in July of 2008. We are now a Division I University, but we will go through a certification process during the next two years, akin to accreditation. The Division I decision impacts more than just athletics. It is an institutional decision and we are pleased to have Dr. John Meisel, Professor of Economics and Finance, and the members of the Reclassification Work Group assisting us in this transition. Will Dr. Meisel, Chair of the Work Group, and its members, along with Brad Hewitt, Director of Intercollegiate Athletics, the coaches and athletics staff members assembled here, please stand and be recognized. Our Division I status, increased grants and contracts, growing enrollment and other initiatives, such as University Park, will continue to significantly impact our region. For instance, during the last five years, we have initiated and/or completed many projects through the Schools of Business and Engineering, involving faculty from Arts and Sciences and across the University to assist in the economic development of the region. Our Special Assistant to the Chancellor for Regional Economic Development and Executive Director of University Park, Jim Pennekamp, continues to work with the American Red Cross to bring them to campus by summer 2010. I'd like to recognize others responsible for directing our economic development efforts - Kevin Hubbard, SIAM (Southwest Illinois Advanced Manufacturing Center); Kwa Mister, Small Business Development Center; Silvia Torres Bowman, International Trade Center; Mary Sumner, Construction Leadership Institute and Project Management Training; and Kristine Jarden, Entrepreneurship Center. Would these individuals please stand with Jim Pennekamp and his staff, along with Dean Gary Giamartino and the faculty and staff from the School of Business to be recognized. As good stewards of the resources with which we have been entrusted, all of what we do is influenced by our budget. This year our state budget includes $4.2M in federal stimulus funding. If the state does not find a source to replace that money, we will experience a reduction next year. The reduction could be greater than $4.2M if the economic situation in Illinois worsens. We may also be affected by reductions in state support for reimbursement of the tuition waivers we provide to veterans. As we plan for those possibilities, we have two things that work in our favor: (1) we have experienced steady enrollment growth that constitutes a source of revenue; and (2) we have a process administered by the University Planning and Budget Council that results in budgeting our resources conservatively. Last year we instituted some efficiencies that will save us money, and we will be investigating more approaches this year. I'd like to recognize Bill Winter, Budget Director, John Navin, Professor of Economics and Finance and Chair of the UPBC, and the UPBC members who are assembled here for their excellent stewardship. Will you please stand. Today, I have recognized a number of people in this room, and if time permitted, I could recognize many more. Together, we, staff, students, faculty, administrators and our supporters during the last five years, have worked hard to bring about the realization of our vision statement. I thank each of you for your work on behalf of our students and for your contributions to our sense of SIUE community. We are seeing the future of SIUE unfold before our eyes. Since my arrival at SIUE, I have been saying: We are not what we were five years ago and we will not be five years from now what we are today. Clearly, that statement still rings true today. Over the past five years, we have made material progress in the realization of our vision statement. But our work is not through. Our quest is not yet achieved. Being lauded as one of the 77 "up-and-coming universities in the United States" is not enough - it is not our vision! We remain committed to the citizens of Illinois, the region we serve and the students we educate. We remain committed to our strategic goals and our University values. We remain committed to achieving national recognition for doing the right things and doing them well. We remain committed to our vision statement. And we remain committed to the notion that the purpose of higher education lies in the fulfillment of human potential. If you have recently joined the SIUE community and these commitments are new to you, or if you are renewing your commitment to our goals, values and vision statement, I invite you, as I did in 2004, to join us in this quest. We have made material progress by 2010 and we will achieve national recognition by 2015! Go Big E and Go Cougars! Thank you.